The futures of Northampton Saints boss Jim Mallinder and his staff are safe, according to chairman Leon Barwell. Saints lie outside the Premiership's top four after losing three of their last four games and went out of the Heineken Cup at the group stage. "There won't be any changes. There will certainly be no more goings anyway," Barwell told BBC Radio Northampton. "We recognised early in the season that the coaching structure wasn't perfect, that we needed to freshen things up." He added: "Not to replace what we've got but to add to what we've got and build on our strengths." 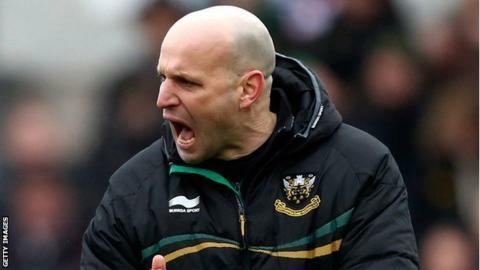 Mallinder, who was following Martin Johnson's departure 15 months ago, joined Northampton in 2007 and has led the club to promotion to the Premiership, wins in the European Challenge Cup and Anglo-Welsh Cup finals, two Premiership semi-finals and the Heineken Cup final in 2011. But they have failed to reach the Heineken Cup knock-out stage for two consecutive seasons and are currently five points adrift of a Premiership play-off place. He will be replaced by former Wasps and England fly-half but is being covered by academy boss Alan Dickens in the meantime. "It's very clear we have put a strategy in place," continued Barwell. "Alex King was at the game on Saturday, so he knows the size of the task in front of him. "He'll be a brilliant addition to the coaching setup. We're not in this for the short-term, we've got a very bright future. "We've got to focus on driving forward and being ambitious and hopefully achieving some of our ambitions."